Last edited by mn230199 on 2017-02-17, 21:57, edited 1 time in total. That seems to have fixed it, Thanks! Dark Moon has been updated to v1.5.2. Dark Moon has been updated to v1.6.0. Dark Moon has been updated to v1.7.0. Great theme, but please make smaller the "free space" with tab on top. c-sanchez wrote: Great theme, but please make smaller the "free space" with tab on top. Lootyhoof wrote: What OS are you using? Windows XP, I'm using "New Moon" the Pale Moon fork of Feodor2. Sorry, but I cannot and will not support a platform that Pale Moon itself doesn't officially support anymore. I've enough platforms to maintain as-is. Hallo. How can I change the color of the window's title in my customized Dark Moon? Dark Moon has been updated to v2.0.0! In this major update, the entire theme has been re-based (re-written from scratch) from White Moon v3.0.0, including all the features that update brought and more. Most notably though, this also muchly improves support for Linux and macOS, plus features a re-designed tab styling and much better HiDPI support through the use of SVG icons. zarite wrote: Hallo. 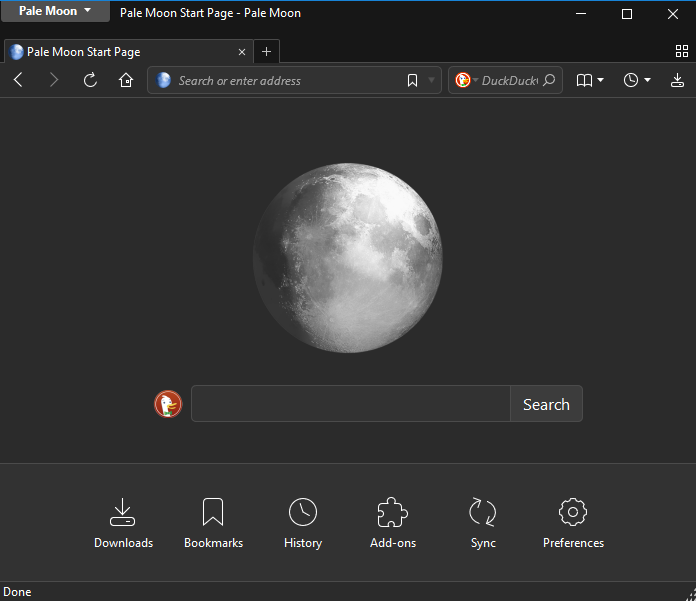 How can I change the color of the window's title in my customized Dark Moon? Last edited by Lootyhoof on 2018-05-16, 22:24, edited 1 time in total. When first loaded up I get a default image overlay instead of the solid black. Ignore the icons. With the previous version I had. it defaulted like this. Which is normal for me. I thought perhaps it was "Persona Switcher 2.0.4.1-signed" but disabling it did not change it. I'm not even sure where this "persona" color is coming from since I don't have a persona in that color. If I change back to the previous version it acts normally. I just thought I would put this out there. It doesn't bother me as I use this theme with persona's and other icons anyway. And it looks normal anywhere else. Not sure if this is something weird on my end or if others might have seen it. I couldn't find anything else on my list of add on's that would make this behavior. I'm going to try a new profile just to see if it changes anything. I let you know what I get. Odd...I can't confirm this. Is that Windows 7? On what toolbars are those? What extensions do you have installed? Last edited by Lootyhoof on 2018-05-17, 21:36, edited 1 time in total. Lootyhoof wrote: Odd...I can't confirm this. Is that Windows 7? On what toolbars are those? What extensions do you have installed? Yes, W7 64 bit with latest PM The tool bars shown where my menu bar, navigation bar and for showing the issue I also showed the bookmark bar but I normally don't use that one. As for add on's. Hmm a lot. Ok, tried on a new profile and it's fine. So, I have no idea what add on is causing this. It's weird that it doesn't do it on the older version but does it on the new. Hmmm. Ok, so I went through and disabled all my add on's and it was fine. So not a bad profile. I started to figure this out when I was re-enabling and saw the top bar " which I normally don't ever see"
Well, that didn't take long. Turns out that Hide Caption Titlebar Plus has a setting just for this. Who would have thought. It has not worked since I have been using it, so this was new to me. Oh well, now if someone else comes along and has this problem they will know where to look. Last edited by Thehandyman1957 on 2018-05-18, 01:29, edited 4 times in total. Dark Moon has been updated to v2.0.1.